When I was sent this announcement of a conference on evolution at Cambridge University next year (click on screenshots), and when I read the program and saw the speakers (links at third screenshot), I smelled a RAT (abbreviation for “rubbish and Templeton”), but I didn’t know for sure that the John Templeton Foundation was one of the sponsors till I clicked on the page given in the fourth screenshot. This is the same tired old panoply of buzzwords that we’ve seen before: developmental bias (true in some sense, but we haven’t the slightest idea how important it is in evolution), developmental plasticity (a substitute for natural selection and mutation in initiating adaptive evolution, but again with virtually no evidence to support it) and “extra-genetic inheritance”—read “epigenetics”—another completely unevidenced factor in adaptive evolutionary change. What we have in this program, then, is a group of overly ambitious people, instantiated in the “Extended Evolutionary Synthesis” site (see below), who keep writing papers and having meetings touting their unevidenced theories, hoping that by sheer force of verbiage they’ll hijack modern evolutionary theory. As for “balance”, there isn’t any in this conference: I see no critics of these buzz-topics on the program (they could, for example, have chosen the eminent critics Brian Charlesworth or Doug Futuyma, whose papers I cite below). We already know that new variation can arise through horizontal gene transfer as well as mutation, but that’s not part of the EES, whose proponents want to include epigenetic variation induced by the environment that mysteriously becomes heritable and a part of the DNA. Then—presto—adaptive evolution occurs! That there is not a lick of evidence for his idea hasn’t fazed its supporters at all. As I’ve stressed before, there is no evidence for any epigenetic changes lasting more than a couple of generations, and virtually no evidence that such changes have been part of adaptive evolutionary change. And to “natural selection”, which has been demonstrated time and time again, EES proponents want to add another arcane mechanism in which nonadaptive developmental plasticity somehow becomes incorporated into the genome as an adaptive phenomenon. Despite thousands of pages written about that, there are no convincing examples, and therefore NO evidence that such plasticity has played an “important” role in evolution. Futuyma, D. J. 2015. Can modern evolutionary theory explain macroevolution? Pp. 29-85 in E. a. N. G. Serelli, ed. Macroevolution: Explanation, Interpretation, and Evidence. Springer, Switzerland. What do people think of the EES? The EES has been met with both enthusiasm and skepticism. The majority of responses to the EES research program are extremely supportive, but there are of course those who claim that the EES is not going to do any good. The skepticism is to some extent warranted, as the EES has yet to prove itself a vehicle for productive research within evolutionary biology. That is why this project sets out to put EES predictions to the test with a dedicated research program. The project aims to show that, precisely because it is spelled out in a disciplined way, the EES can stimulate novel questions, devise critical tests, open up new lines of enquiry, and provide insights that are unlikely under traditional perspectives. Well, you know, these ideas have been floating around for about fifteen years or more, and if the EES hasn’t proven itself productive, except in getting dosh to scientists and yielding an endless stream of speculative papers, maybe it’s time to reassess its value. But as long as Templeton keeps handing out millions of dollars to promote these ideas, there will be a never-ending stream of grant-hungry scientists with their hands out, eager to advance their careers by promoting the Templeton agenda. To my mind, this is the biggest example of misguided careerism I’ve seen in evolutionary biology over my lifetime. This entry was written by whyevolutionistrue and posted on August 21, 2018 at 9:00 am and filed under epigenetics, evolution, woo. Bookmark the permalink. Follow any comments here with the RSS feed for this post. Both comments and trackbacks are currently closed. Behind every great crime is a great fortune (if I may be permitted to mash-up Balzac a bit). And behind the current crop of crimes against biological science, the great fortune belonged to John Templeton. Templeton funded it, but who are the freaks who are running it? Or should I say “what”? Oops. I meant, who runs Templeton? Does Chemistry have to put up with such appended terms as Modern Synthesis etc? New approaches come along from time to time, but I don’t think anyone tries to redefine the discipline. The quantum stuff still seems to divide people. My father, a “traditional” synthetic organic chemist seems to have never found it useful. I suspect his counterpart today to be a bit more optimistic, since we have more computer power to use. In the 19th century there were a lot of competing schools of thought. To pick one of many examples: Mendeleev was *not an atomist*. He wondered if perhaps the elements corresponded to peaks of a wave and that one could have intermediaries, elements lighter than hydrogen, etc. 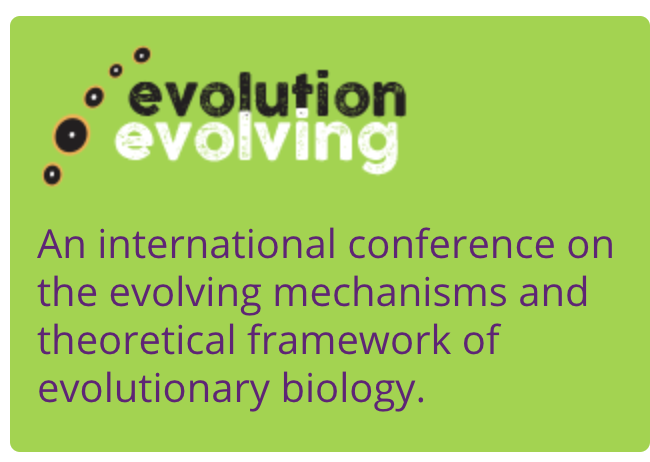 I can’t find the organizers on the website https://evolutionevolving.org/ . Their names are at the bottom of the contact page. I noticed from Twitter that EES is one of Massimo Pigliucci’s fetishes, alongside fighting the imaginary rise of “scientism”. Do you know if he has any connections with Templeton Foundation? Luckily that page says: “We are hosting an international conference in Cambridge UK, 1-4 April 2019, as a grand finale of the John Templeton Foundation grant supporting this research program.” So, at least the Templeton grant support is finished. Anyone know anything about real results of that program? Filthy lucre or not, if these people follow the scientific method of “conducting critical tests of key EES predictions” and subjecting them to peer review and replication, should not the truth come out in the end? I haven’t seen any “key EES predictions” that could be tested. These wrong headed notions within evolutionary theory are not new & the stink of them has wafted around for entire careers. There’s no reason for this to change going on past performance. Jerry can say more, but I take it that his complaint is that *it has*, and we don’t need to rehash so much. Does proving mathematically that anything group selection can explain, can be better explained by kin selection, count? 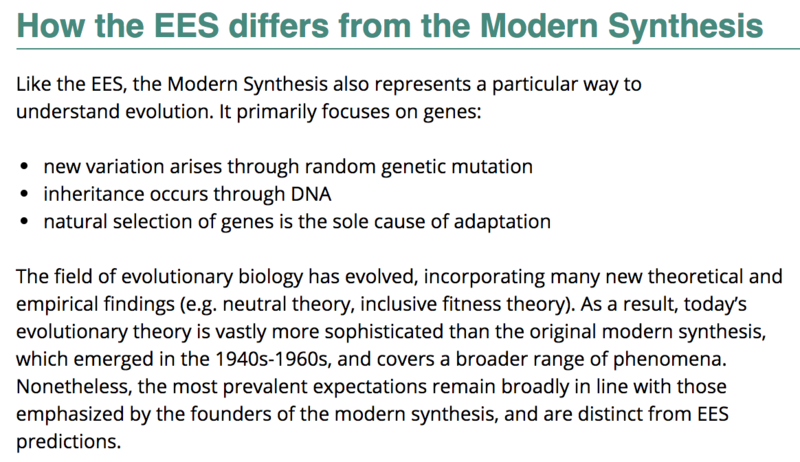 I think any prediction by an EES theory that does not distinguish it from the Modern Evolutionary Synthesis is a waste of time. EES needs to predict something that the MES does not. Demands for predictive power are a symptom of the oppression of the Kyriarchy. Actually all they’ve done is mutated. An item I see is that in the first screenshot are a series of bulls-eye patterns. That can only mean butterfly eye spots, which has been an interesting and profitable area of legitimate evo devo research. In short, networks of genes that have long been used for development of physical anatomy, like the locating and outgrowth of appendages, are turned on developing wings to control genes for pigments. The result are the eye spots in lepidopteran wings. It is really cool! So they are presumably going to get this interesting thing all icky with their crap philosophy. I pretty much agree with Mark on all points. I have not read the book but from the review it sounds like a book about a phenomenon that has long been known and does not present any kind of problem for Darwinian evolution. It’s hard to tell from the review if the book is anything more that itself a review of our knowledge of horizontal gene transfer (that would be a welcome book) or if it’s another one of those authors who thinks they’ve got a Revolutionary New Way(TM)to explain Evolution. In short, in terms of this discussion, this is not a very informative review of the book. Perhaps someone here has read it? The book itself does not seem to push a new theory, at least based on the content of the review itself. Titles of articles are at times not made by the author that wrote the article, and so the title may seem sensationalized while the article itself is ok. That is my take on it in this case. Based on the review, the book is about how ‘horizontal gene transfer’ has altered the tree of life so it is not just a tree with vertical descent from ancestors to descendants. There are occasions where DNA is transferred ‘horizontally’ between different lineages. Almost all of this occurs among simpler prokaryote cells (bacteria and archae), but it is thought to also lie behind the singular origin of eukaryote cells (animals, plants, fungi, et al). This is an interesting but well accepted aspect of life today. It is a bit startling when one first learns of it, but in the end horizontal gene transfer is another source of genetic diversity that is then subjected to natural selection and genetic drift. Thanks to you and Mikeyc for your comments. I have reviewed this book and I will give more information tomorrow when my take comes out. 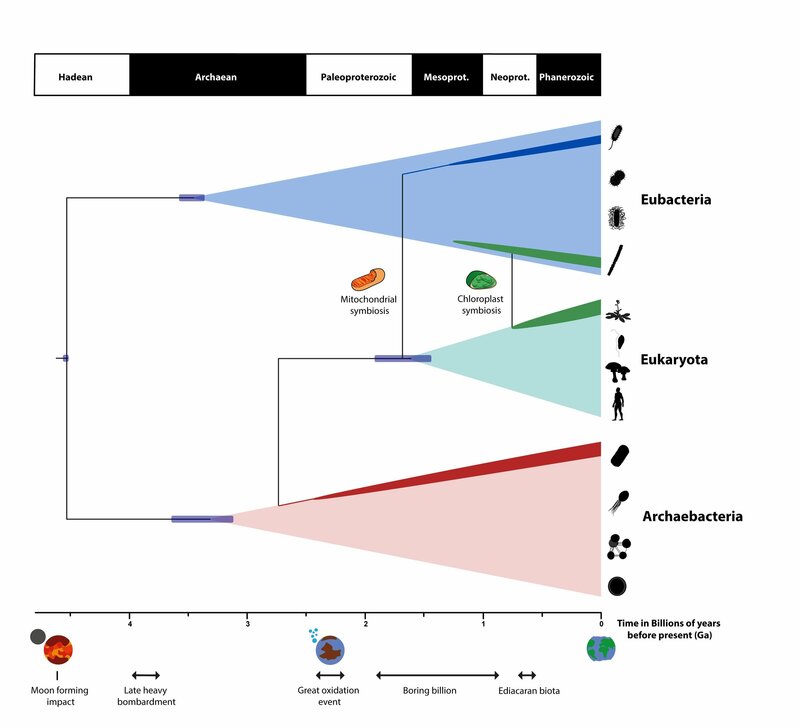 In eukaryotes evolution describing parent-offspring relations, whether sexual or parthenogenic, CAN be represented as a tree. DNA can “invade” tree-like relationship by horizontal gene transfer, even in vertebrates. There doesn’t seem to be evidence that these injections of DNA have much effect on the particular paths “higher” species take during evolution. Here is a recently discovered case reviewed by Ed Yong a few years back: 25% of cow DNA originally came from a snake! Horizontal gene transfer (HGT), or in general a net representation when resolution is poor, complements rather than supplants traditional vertical gene transfer tree topologies. There was, and to some degree still is, an active discussion on how much HGT affects lineage topologies since early sequencing showed that it happened so often that it had to be actively considered and controlled for. I.e. due to 4.5 billion year of evolution*, even at low frequencies HGT has happened on average roughly once per gene. Modern methods are able to account for it. Notably, if the root credibility interval correspond to actual history, it is barely enough for the crust to cool after the Moon creating impact. The image is from the press release, and it seems clicking on it will expand so it is legible. Oh, and speaking of “the best”, they used the new and precise date for the Moon forming impact. So that part at least is sound. Can’t believe they didn’t invite you Jerry. this is the biggest example of misguided careerism I’ve seen in evolutionary biology over my lifetime. You beat me to it! April first was the first thing that I noticed. Very apt…. How does group or multilevel selection theory fit into this? Is it part of EES or a separate line of argument? I finished Robert Sapolsky’s Behave recently and he seemed to accept group selection theory, which puzzled me. They are both in that big grab-bag of motley pet postulates that make up EES. Conferences, including those on shaky or even completely bogus subjects, are a time-honored tradition in academic life and academic careerism. I’ve come across CVs of junior academics of the post-modernist variety which included no published work at all, but only “conference” participation and presentations. The last word on the sociology of conferencemanship is David Lodge’s hilarious novel “Small World”, which I recommend to one and all. And there’s the escape clause that allows them to toss in whatever numinous crap they want. Strictly speaking, philosophy of science refers to the study of how scientific knowledge is acquired, and how you decide if a theory is valid or not. It does not necessarily refer to metaphysical implications of science. In Pigliucci’s case, it’s treated as a license for accepting or dismissing theories based on how well they conform to the SJW moralistic fallacy. There is a well-established subfield of the metaphysics of science, which includes the feedback into general philosophy from scientific research. They seem to be taking something that is admittedly speculative and trying to find some sort of material substantial backing for it, but avoiding the reality that earlier attempts have simply not panned out. There comes a time when one must simply abandon a hypothesis, or acknowledge it as not testable. I don’t always agree with our host that “nuanced” is a ‘run-word’, but here I think “balanced” is a run-word in the same sense that it is on Fox News. I am more dis-impressed and wary of this than many other Templeton projects I’ve seen. I’m a bit naive, apparently, when they talk about ‘extra-genetic inheritance’ I was thinking of religious indoctrination rather than epigenetics. The specifics of all this are well above my pay grade, but this claim, “Provide definitive evaluations of the significance of hotly contested processes in evolution…”, must be either premature or oxymoronic. Have just looked at the list of invited speakers, and I’m puzzled. Quite a few seem to be working comfortably within the current modern synthesis. Other than Templeton funding, where is the dog-whistle signalling the Third Way types? All very well to have a research program. The Discovery Institute has or had one of those. How long has that been going? 20 years or more? At best that was delusion in search of confirmation. Perhaps EES will prove more scientifically productive than ID. I have my doubts.